Oosttaverne Wood Cemetery, the final stop on our Tour of the Messines Ridge. 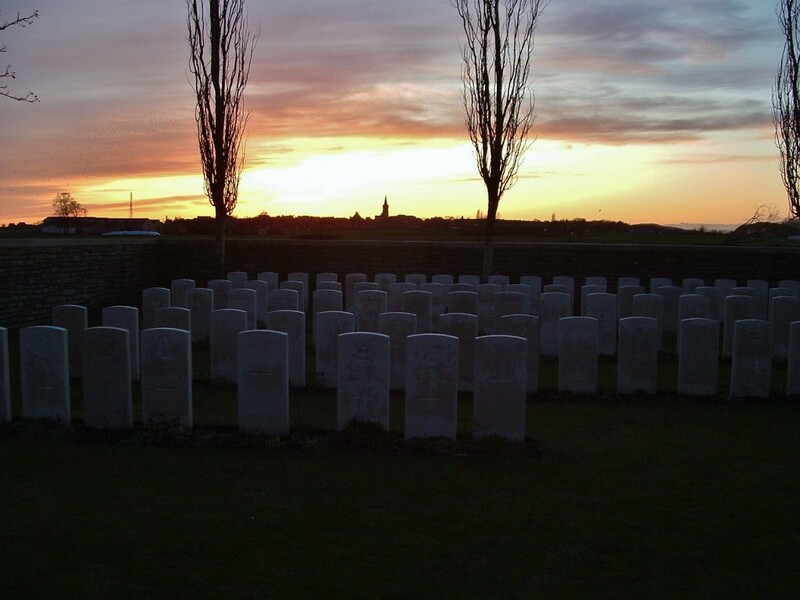 The cemetery* was begun on the evening of the 7th June 1917 when men of the 19th (Western) Division and the 11th Division captured this section of the Oosttaverne Line, and was used until September 1917. *actually two cemeteries, as I shall explain later. 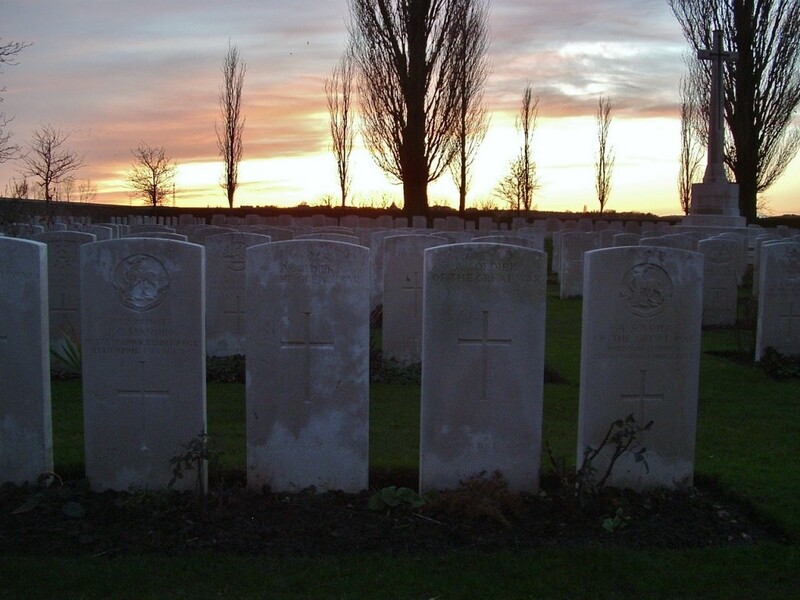 If you visit any of the cemeteries on the Western Front, try to remember to sign the Cemetery Register. 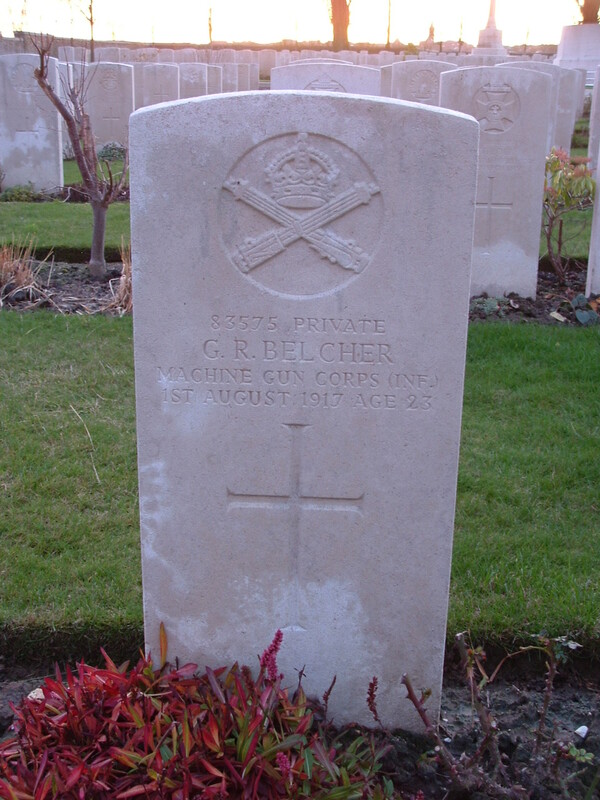 It provides useful information for the CWGC and anyway, they’re often worth a few minutes’ investigation. 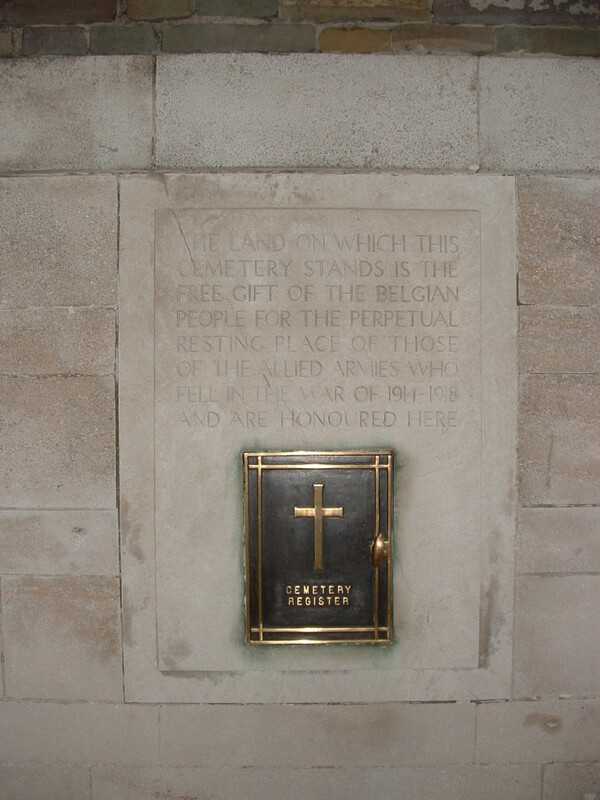 …as are all the headstones you can see beyond the Stone of Remembrance (above) and in front of the Cross of Sacrifice (below). 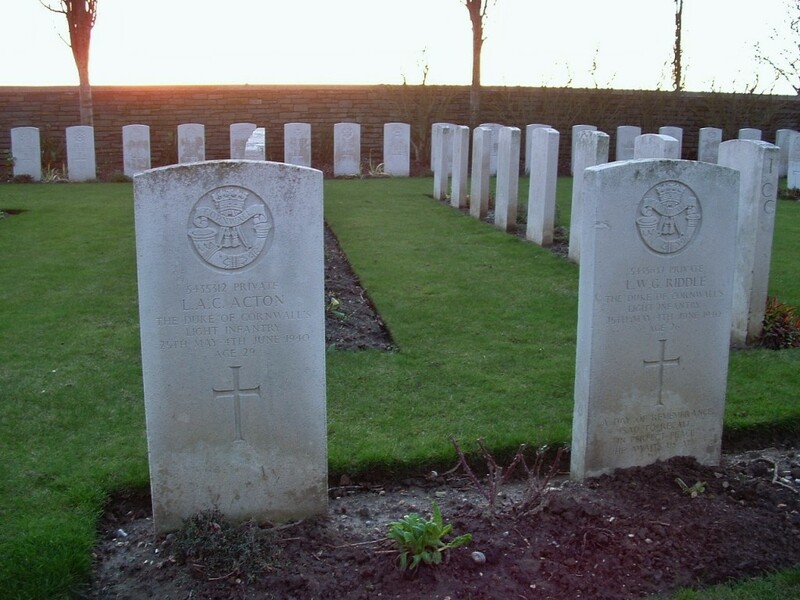 The original graves from 1917 are all at the far (western) end of the cemetery beyond the Cross. 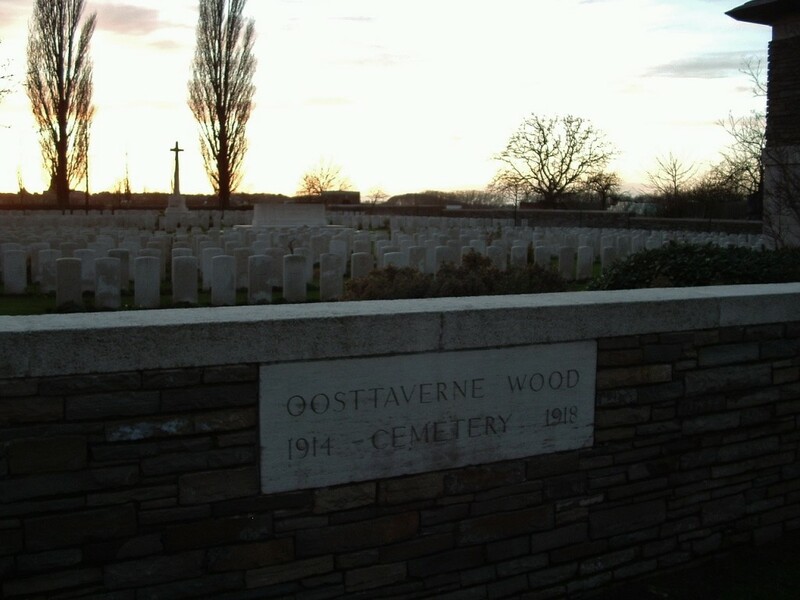 Oosttaverne Wood is in the background, smaller now, I believe, than when it too was captured by the British on the evening of 7th June. 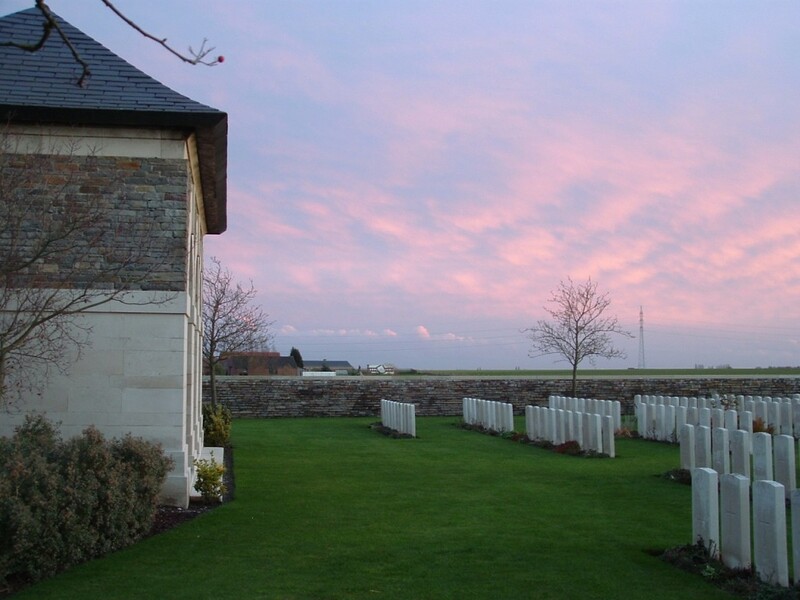 This view, from Plot VII, looks towards Plot V beyond the Stone of Remembrance. 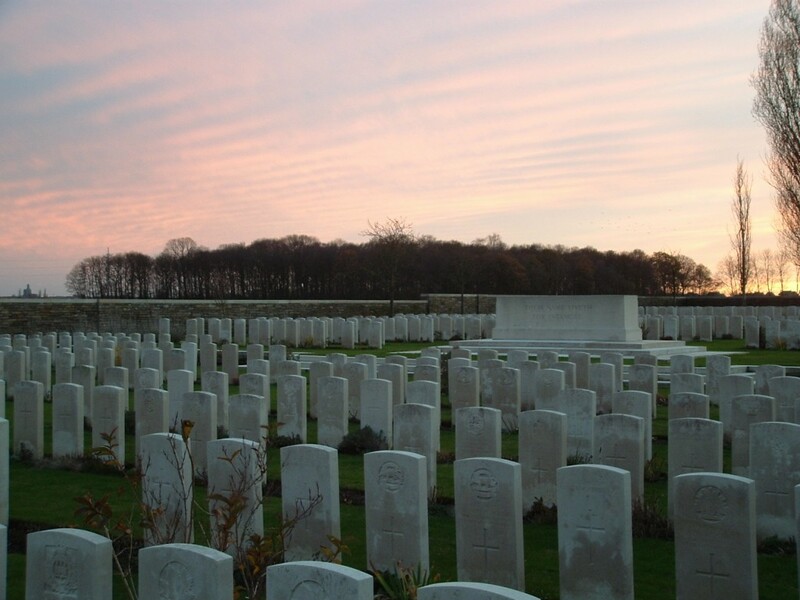 If you take a look at the Cemetery Plan (click the link below) you will see where we are and how significantly the post-war plots enlarged the cemetery. 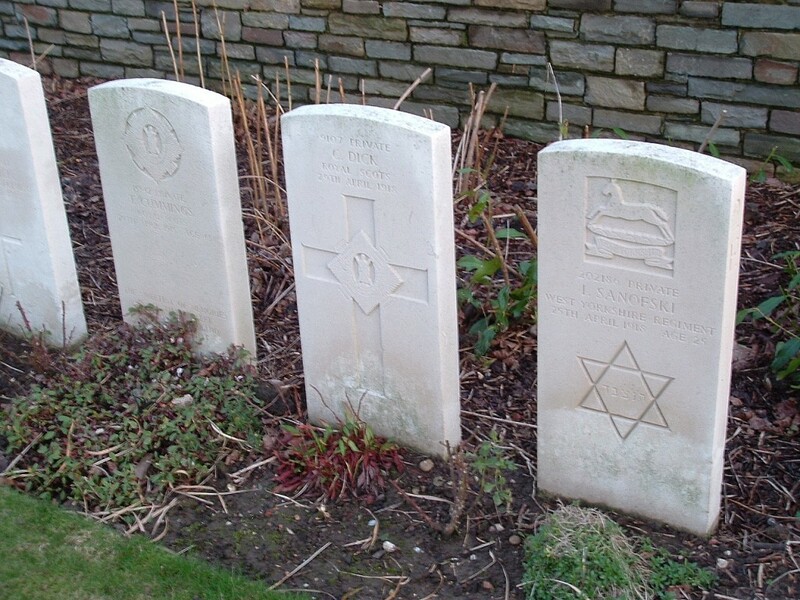 Many of the post-war burials in Plot VII (above & below) and Plot VIII are unidentified. 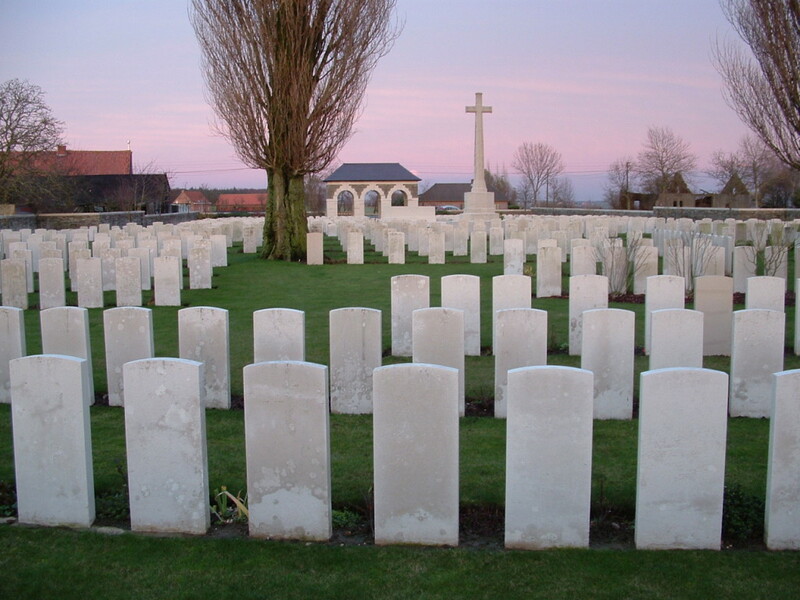 Of the 1119 First World War burials here, no less than 783 are unidentified. This particular headstone is currently undergoing renovation. An unknown soldier of the Queen Victoria’s Rifles in Plot VIII. 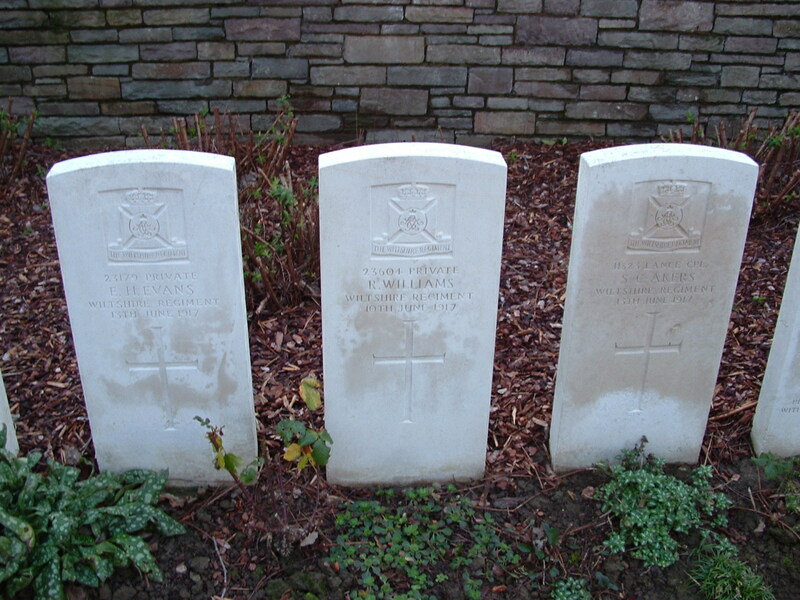 More mainly unidentified burials in Plot V (above & below). 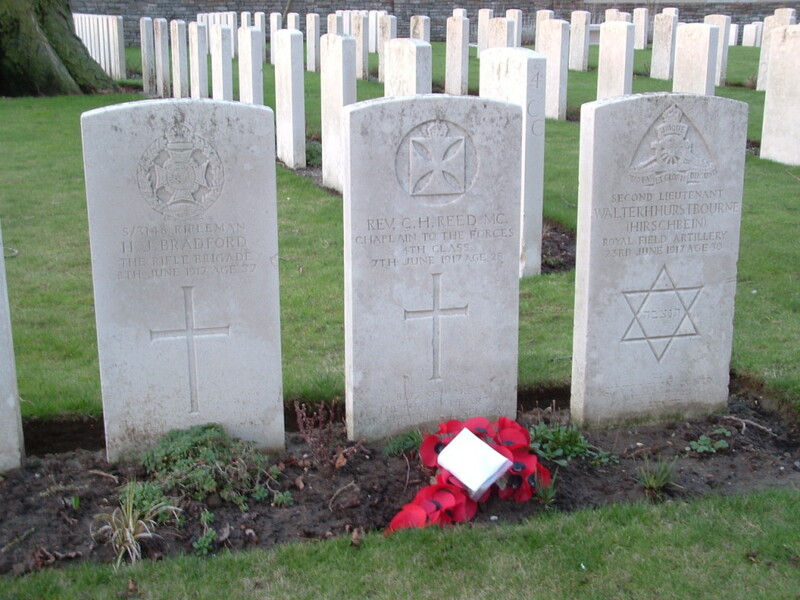 Among the post-war reburials are men who fell during the fighting for Hill 60, two miles away to the north east. British casualties during the week of the Battle of Messines totalled nearly 24,000 killed, wounded or missing. 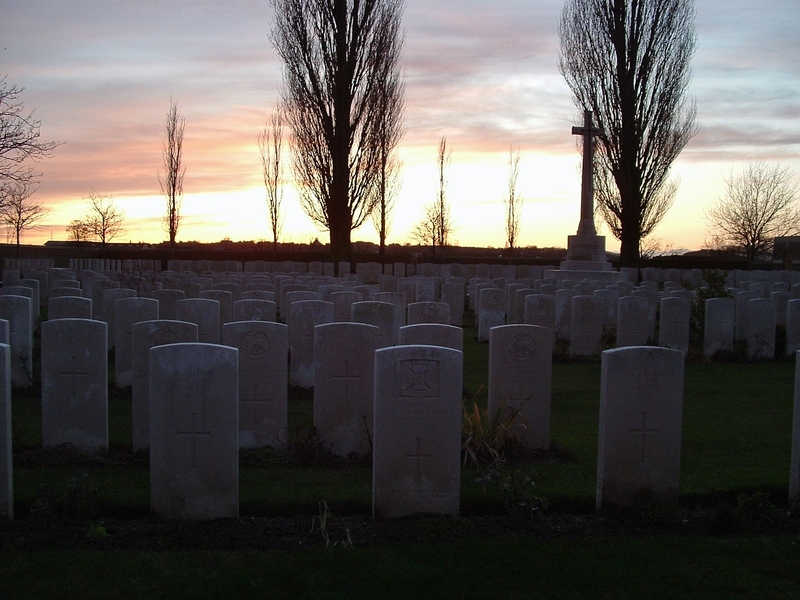 German casualties amounted to 25,000, making the battle one of the few actions on the Western Front where defensive casualties exceeded those of the attackers. 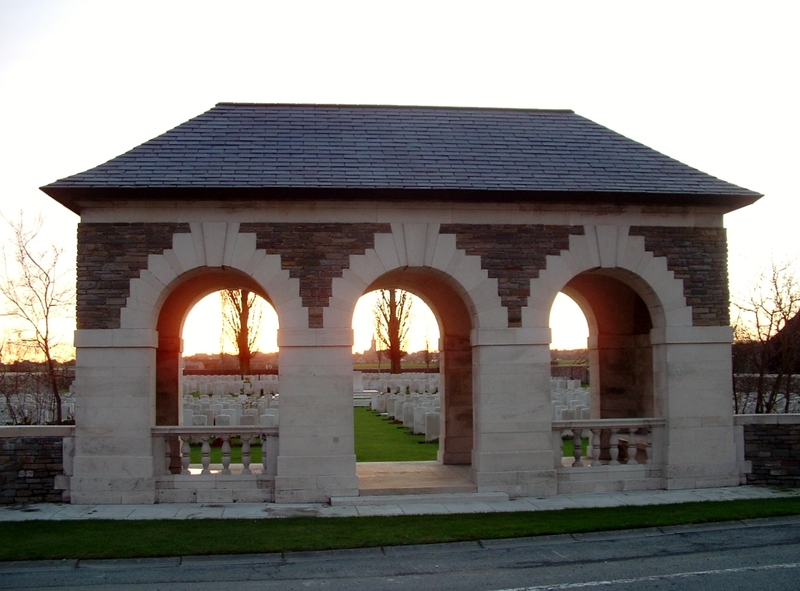 View from the Cross of Sacrifice looking north east past the Stone of Remembrance, back towards the arched structure where we came in. 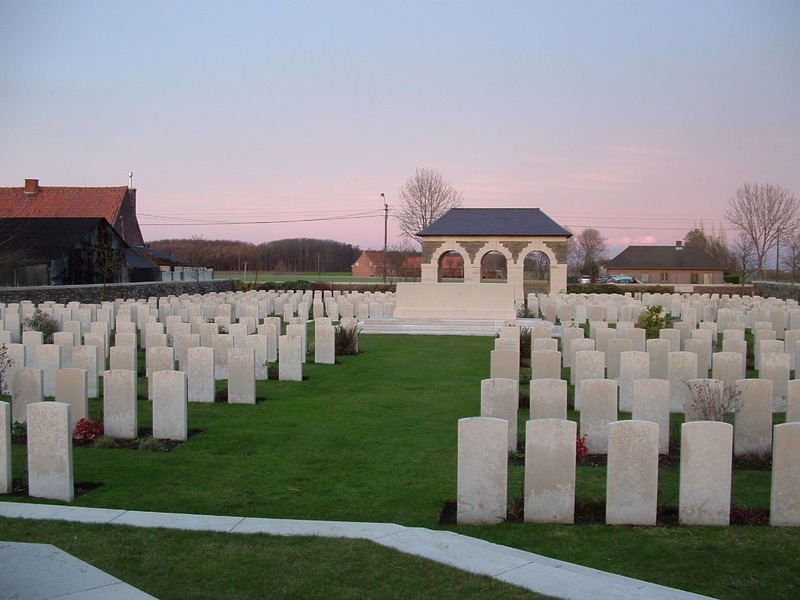 A German trench known as Obstacle Trench once ran down the gap shown here between the headstones of Plot VI on the left, and Plot V on the right; it was captured by the British as they attacked the German Oosttaverne Line, which ran through the fields across the road from the cemetery entrance. The Cross of Sacrifice. The headstones of Plot II in the foreground, from late July and early August 1917, are among the earliest burials in Plot II, one of the three original plots that made up the original cemetery. 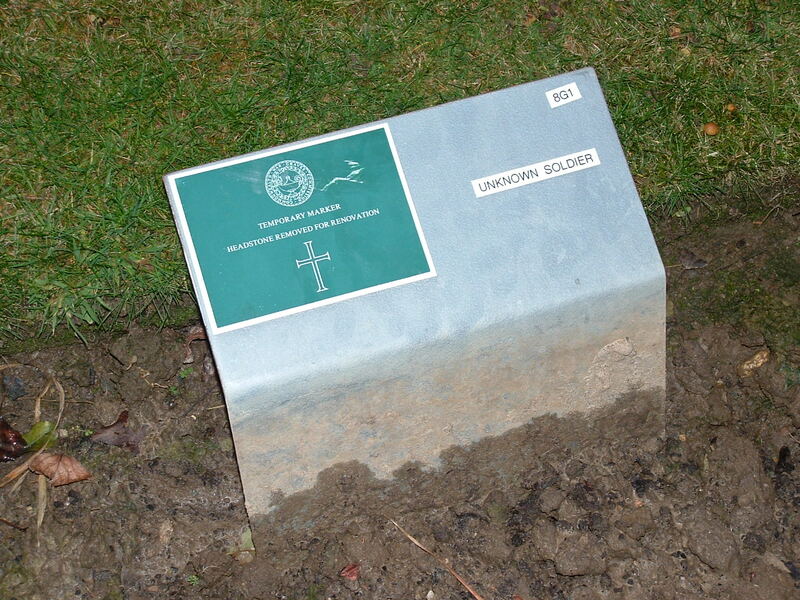 Or cemeteries. I shall explain. 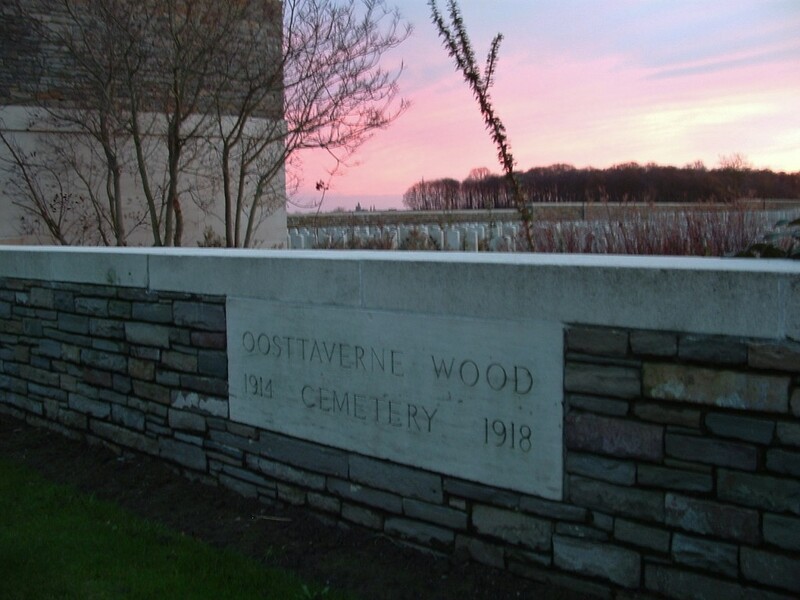 Originally two cemeteries, just yards apart, were begun here in June 1917; Oosttaverne Wood Cemetery N0. 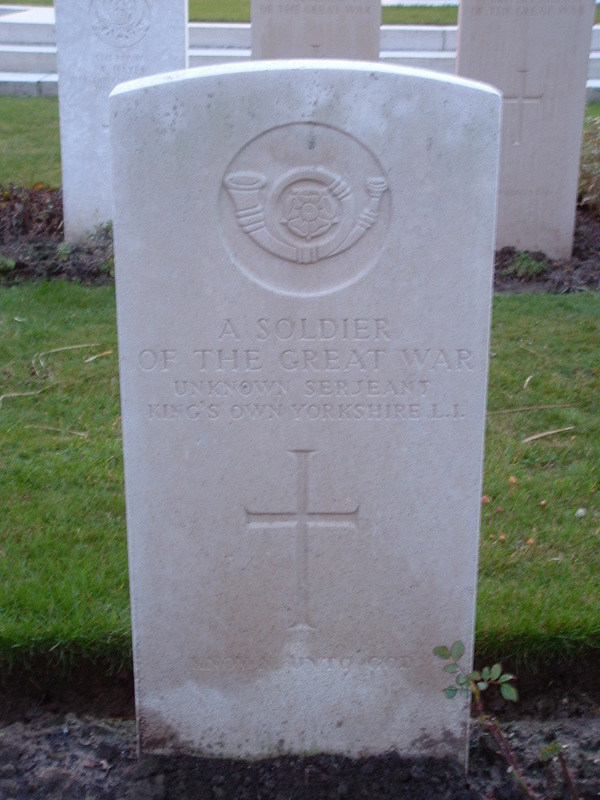 1 and, you guessed it, Oosttaverne Wood Cemetery No. 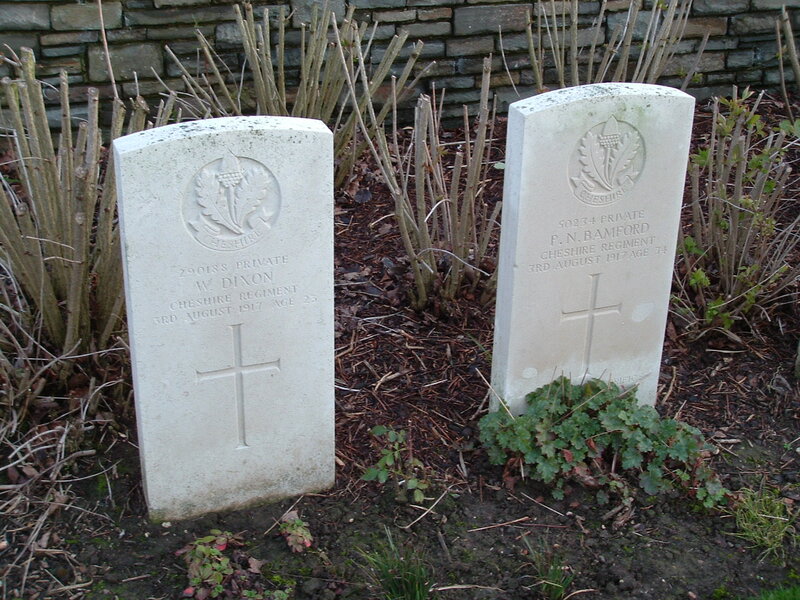 2, now Plots I & III respectively. 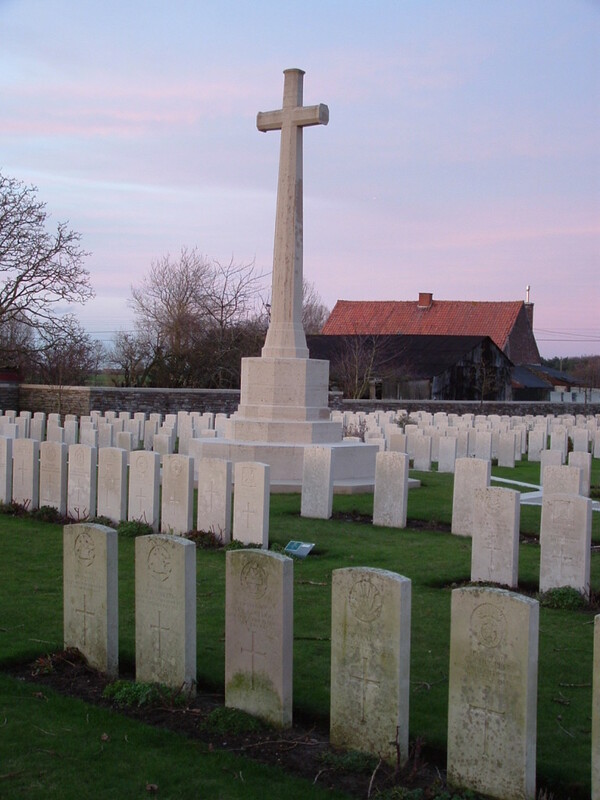 What is now Plot II was begun a little later, as we have seen, in July 1917, as an extension to Cemetery No.1. 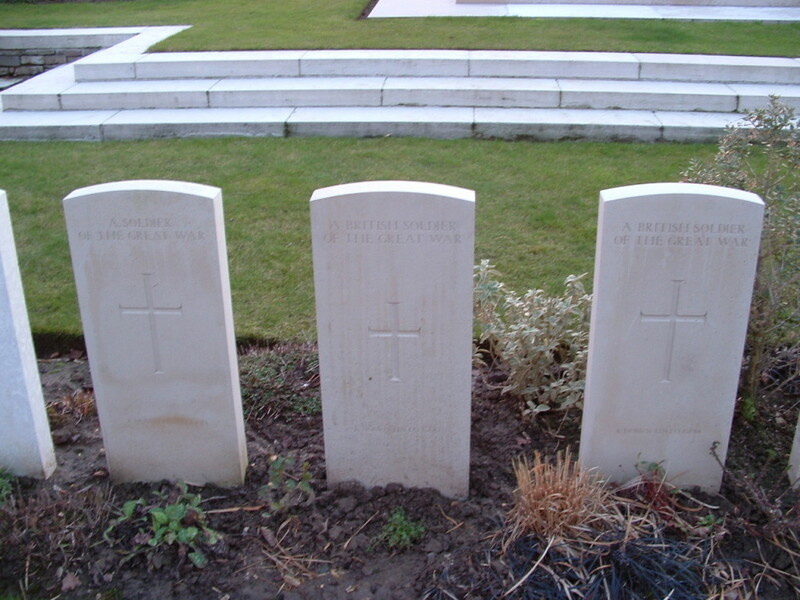 There are 117 Second World War scattered among the burials here, some in Plot II (above, with Plot I behind), all casualties of the fierce fighting during the retreat to Dunkirk in May 1940. 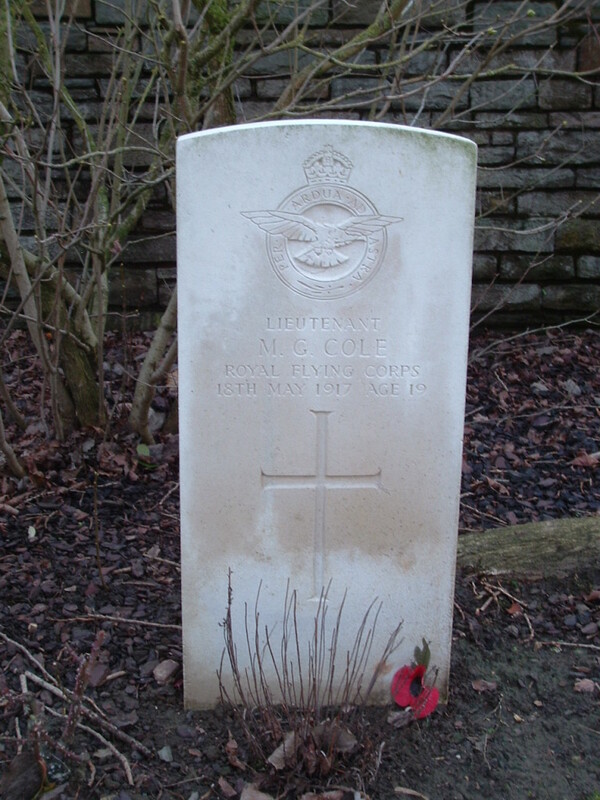 One of five men of the Royal Flying Corps, all killed between January and June 1917, presumably originally buried by the Germans and moved here after the War. 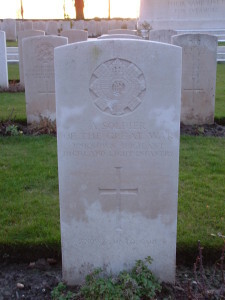 Plot III at the far western end of the cemetery. 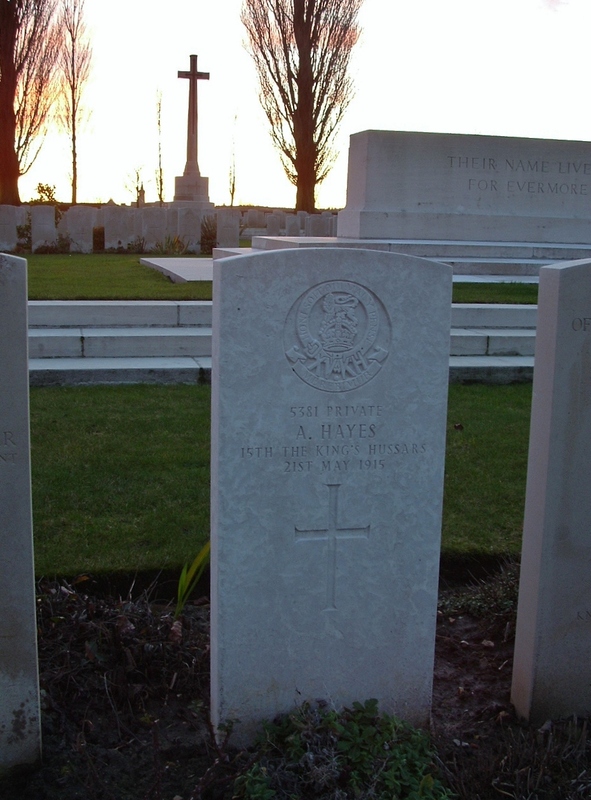 Most of the graves in Plot III are original burials here, although fourteen men killed in 1914 have been added to the Rows E & D at the front of the plot. 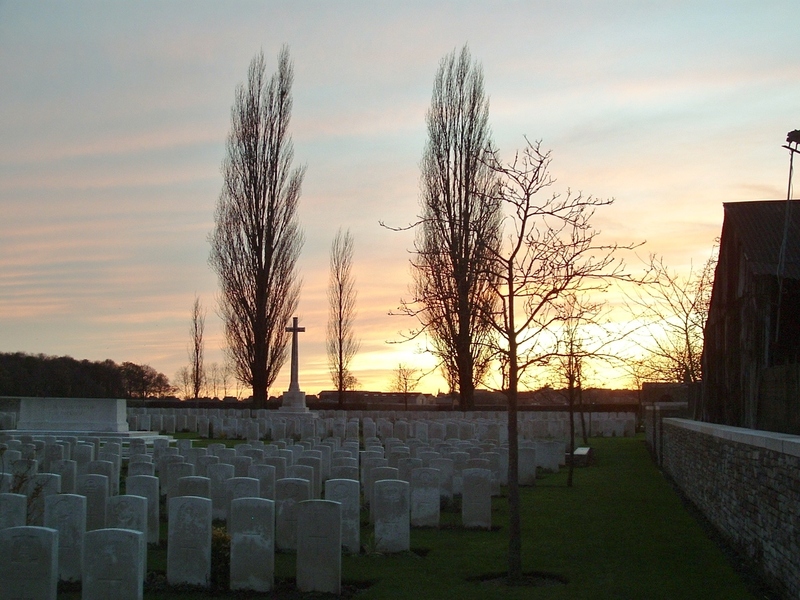 View from Plot III looking back down the length of the cemetery. 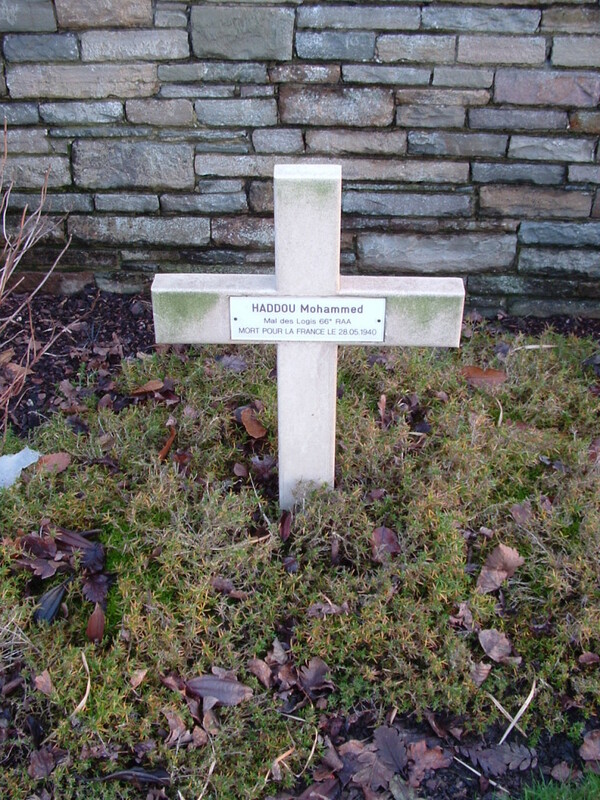 A single Frenchman, killed in 1940, lies beneath this cross just inside the cemetery boundary. As we retrace our steps, this view looks to the west, as the sun finally sets beyond Wytschaete village in the distance. 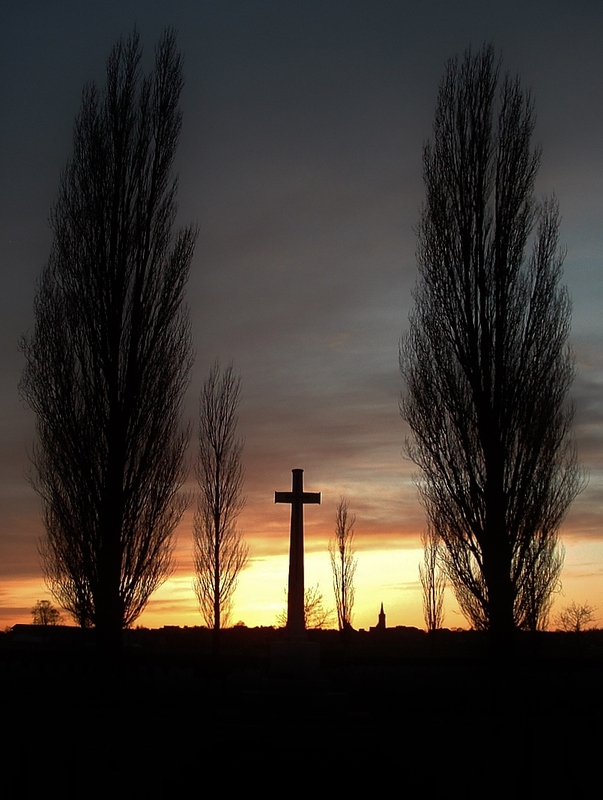 The Cross of Sacrifice and Wytschaete Church, silhouetted against the evening sky. 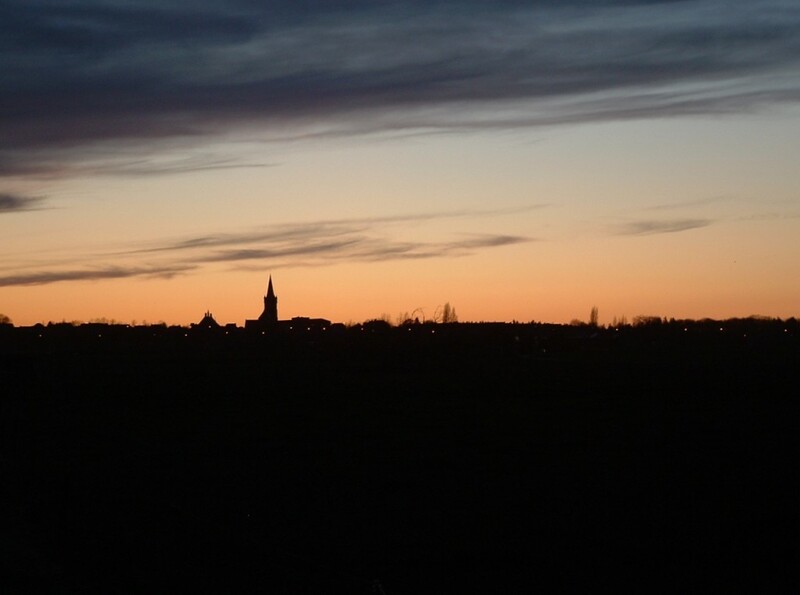 Night closes in on the now peaceful village of Wytschaete as our Tour of the Messines Ridge comes to an end. 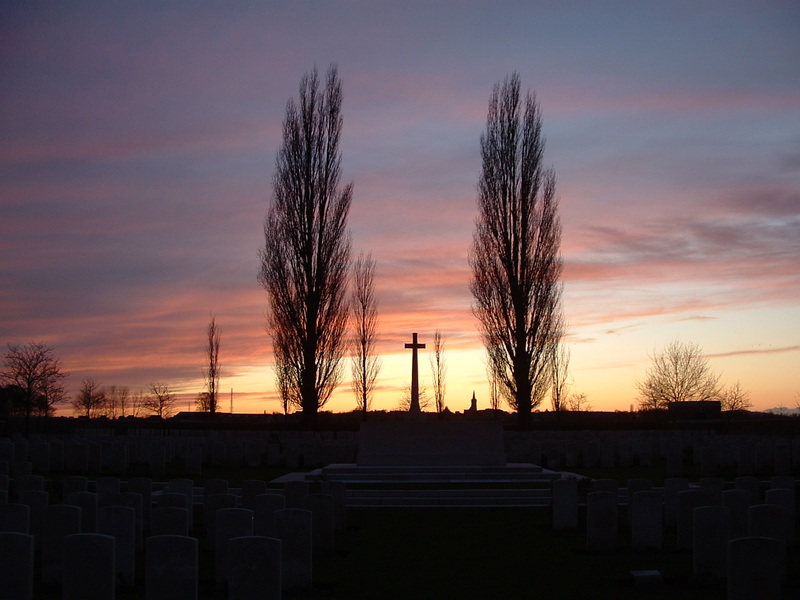 The Battle of Messines had, for the most part, been a triumph for the British and their Allies. 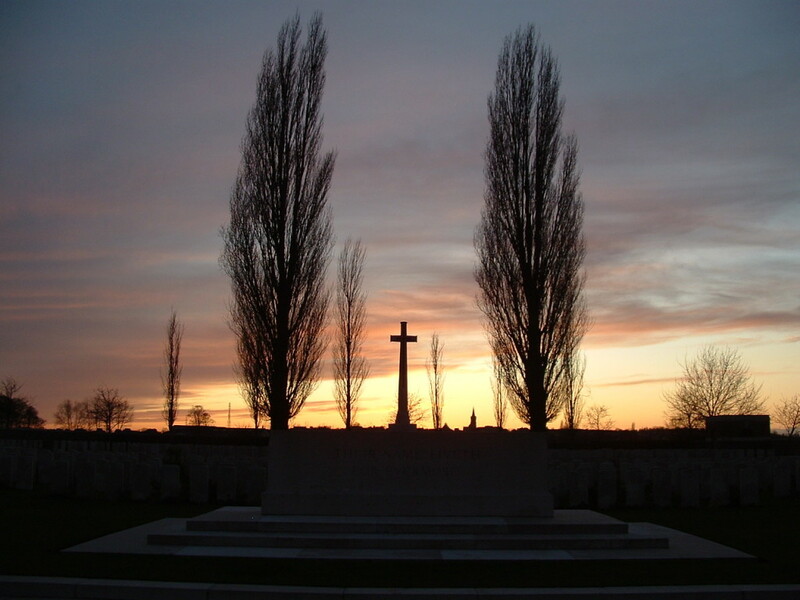 Gains had been made in hours that had taken weeks the previous summer on the Somme. 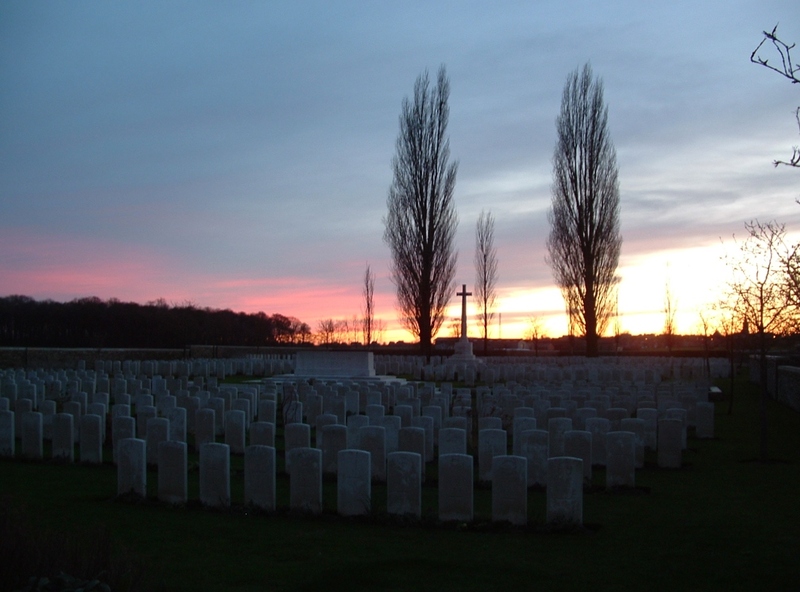 Nothing quite like it had occurred in the preceding two and a half years of war, and nothing quite like it would happen again until the German offensive in the spring of 1918. 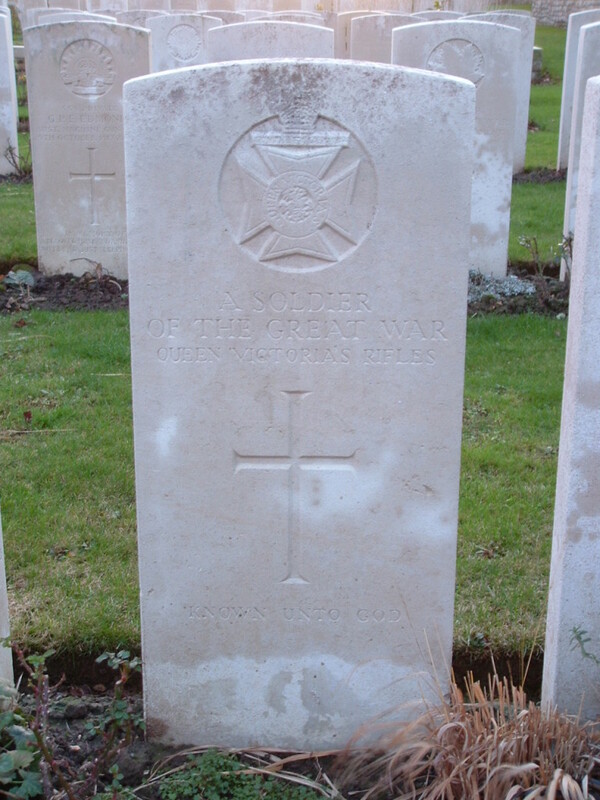 The German salient at Messines had been totally eradicated, allowing Haig’s plans for a great offensive further north to be put in to operation. 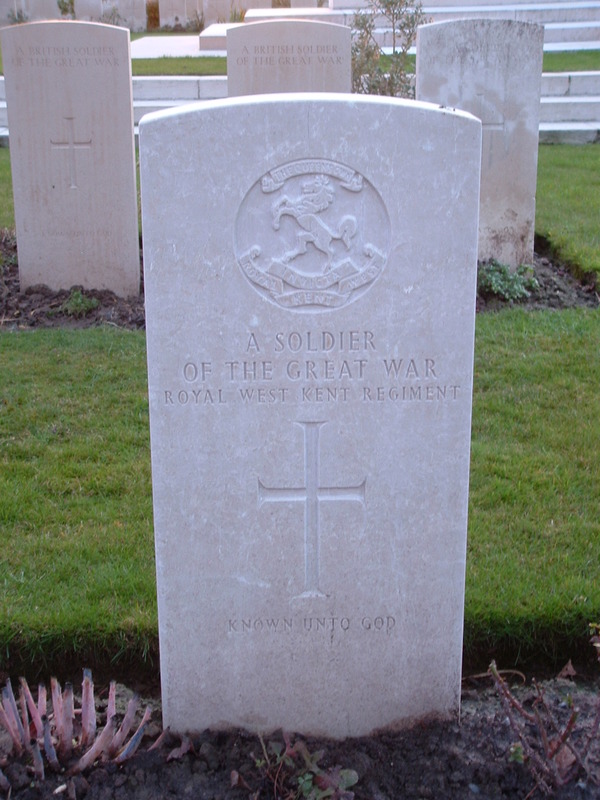 How sad that the optimism of June would give way to despair and death in the quagmire of mud and blood that was to become known simply as Passchendaele. Excellent website, stumbled across you entirely by chance while looking up stuff to do with Larch Wood. Just thought I’d say thanks, sterling work, keep it up. Cheers Nick. Appreciated. Your site looks pretty neat too; I shall delve deeper in due course, but the photographs, just at a glance, look stunning. 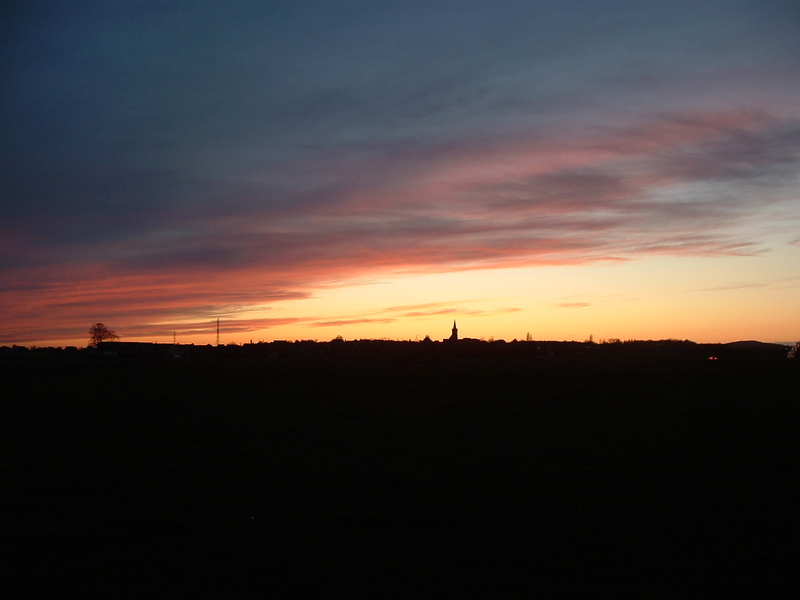 You, unlike me, are a ‘proper’ photographer! Lol! Thanks again for your kind comments. 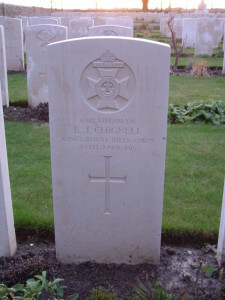 Knew of resting place of family member and very pleased to find your web site. 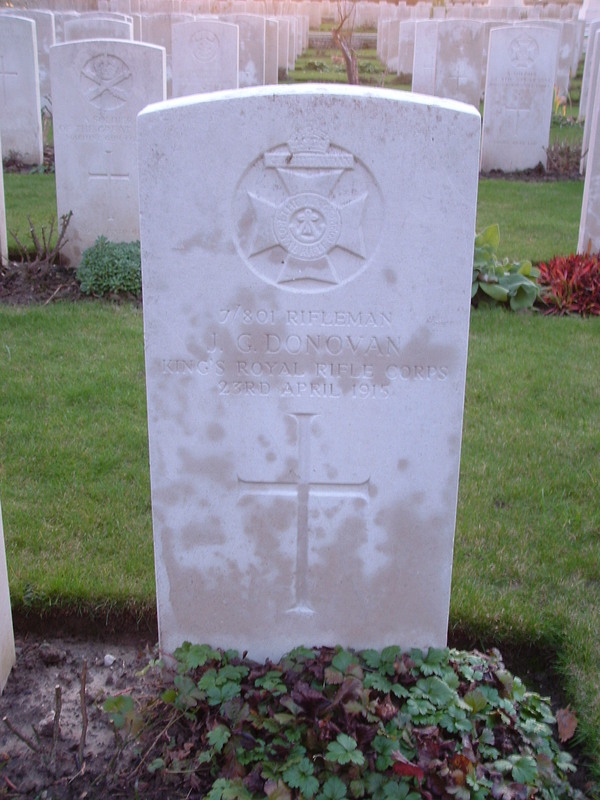 The information re Oostaverne Wood Cemetery was very helpful in finding his resting place, I am hopeful will be able to visit as my husband will be playing with his Pipe Band in the Spring 2019. Hello Morty. Excellent. We like to be of help. I can imagine the pipes playing on an evening like the one I was lucky enough to have at Oostaverne. One of my favourite melodies, of any sort, is a pipe tune. Your husband will know it – you may well know it yourself. 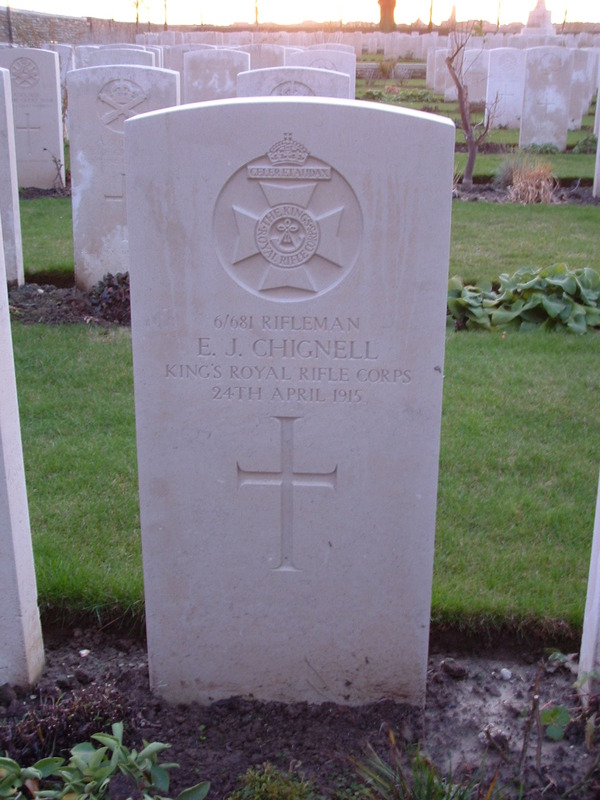 It could be called Kitchen Sink, it just happens to be called Battle of the Somme. The most beautiful melody. Thanks ever so much for taking the trouble to comment, and have a great trip to Flanders. Take some photos! !